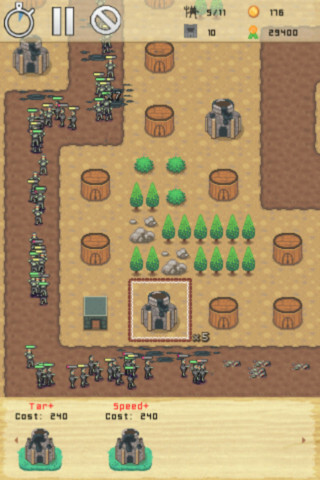 Imagine that game developers were creating tower defence games back in the days of 16 bit consoles such as the SNES and Megadrive and you will get an idea of what to expect with CrossRoad Defenders. The graphics are pure retro with identikit tress and objects, tiny sprites and simple gameplay, but it all gels together really well and is supremely fun to play. 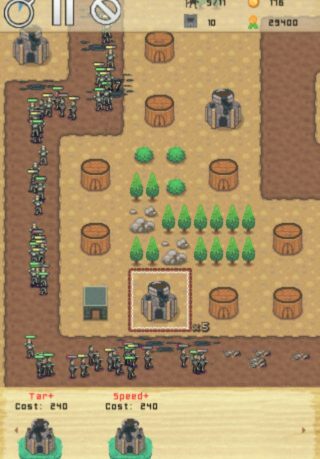 The game tasks you with defending a series of villages and towns from attack by hordes and hordes of enemy runners. These runners can be soldiers, slimes, giant beasts and many other kinds of bad guys, all with different attributes and abilities. They will run along a predefined path from one end of the level to another, and you must build towers along the sides of the road in order to try and stop them. There are various towers you can build. 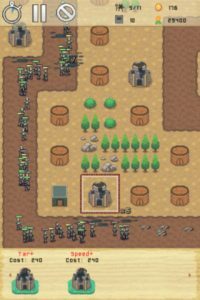 Simple arrow shooting towers that can be upgraded in range and power, infantry supplying towers that produce little soldiers that run out to attack the enemy, toe to toe, others that creates rocks to delay the progress of enemy troops, and many more. They are all simple towers, but they fit in well here. The whole ethos of the game is really cool, and although the game takes a ‘back to basics’ look at tower defence, it all hangs together remarkably well, and it turns out to be quite a refreshing take on the genre. 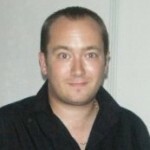 Overall, this retro tower defence game is well worth a look.